Home » Blog » Drains & Plumbing Advice & Tips » Drain Jetting London – What is Drain Jetting? Drain jetting is a very simple but effective method of clearing blocked drains. This technology can be used for most drain blockages and is widely used and standard in the drain cleaning industry. At AlfaClear drains, we use drain jetting to unblock drains for both residential and commercial properties/premises in Ealing and surrounding areas in London. Drain jetting is the most effective and efficient way of removing blockages and cleaning drains. This is done using a special hose that produces a very high powered jet of water which is guided down the blocked drain or pipe – the force of the water will remove most blockages and any debris. From portable drain jetting systems to a much bigger vehicle operated systems – Drain jetting machines come in a variety of models that can be used for different jobs depending on the size of the drain or pipe and the severity of the blockage. This method of clearing a blocked drain London is used by nearly all drainage specialists in Ealing and can be used to solve most drainage problems. So Why use AlfaClear Drains? AlfaClear Drains can unblock drains of all sizes. We have unblocked pipes and drains in Ealing and throughout surrounding areas in London and have a varied portfolio of work from a small single blocked drain at a house to unblocking a series of drains and pipe networks for schools and flats. Our machines are capable of drain jetting London sewer pipes of all diameters – We have engineers who are professionaly trained to use all of our jetting machines and will operate them in a safely manner and leave the site as tidy as when they turned up. Drain jetting is mainly used for emergency drain unblocking in London. However drain jetting can also be used for regular servicing your drainage system to help prevent any blockages and maintain a clean drain. Your drainage system is in constant regular use – from sinks, toilets, dishwashers, washing machines and other appliances that use water. 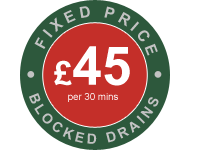 Long-term, it makes perfect sense to have your drains inspected and serviced regularly – AlfaClear Drains jetting service can help you to maintain your system and prevent and blockages from happening. If you would like to get an inspection or service, please call us today. We provide drain jetting in Ealing and surrounding areas in London. Contact us on 020 8723 2424 or email us via our contact form and one of our team will be happy to help.